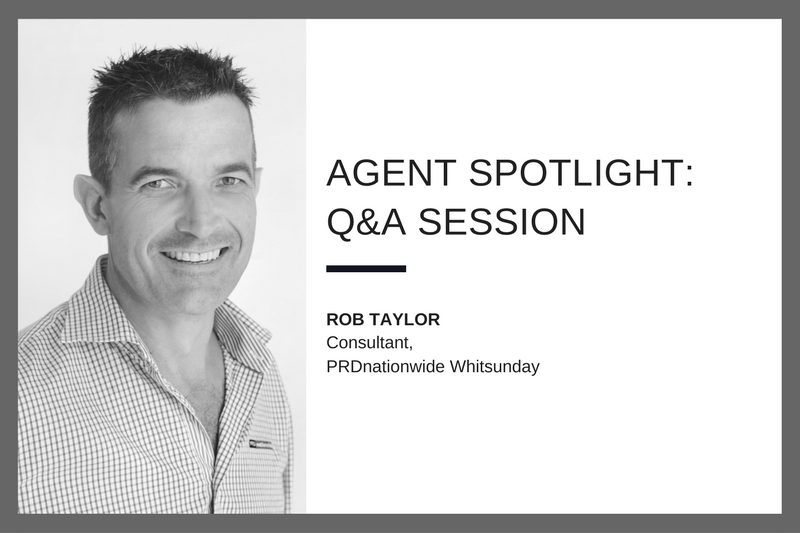 Rob Taylor from PRDnationwide Whitsunday discusses his humble beginnings in real estate and why taking a long-term view of the industry enabled him to excel in his career. As well as the emotional aspect of buying and selling a home. In the interview, he explains how he gives his clients a smoother transaction, which he believes has led to his success. PRDnationwide: Tell us a little bit about your career before real estate. Rob:	Since I left school, I have been working in sales role of some sort. I worked for Coca-Cola and Mars Confectionary both in a sales role and account roles. And then in my late 20s, I went travelling and at the end of it, sort of four and a half years, I ended up back in Whitsunday. PRDnationwide:	How did you land up in real estate industry? Rob:	It's quite interesting, it's quite funny. So, I never dreamed of being in real estate, but in my early years, I used to stop look at the real estate stock videos and the real estate shop windows. Coming back from overseas, one day as I was driving through town with my now wife, we looked up at the beautiful houses, and I jokingly said to her, "we should sell real estate here, " it was just an off the chart comment. A couple of weeks later I saw an advertisement in the paper for a real estate agent, and I thought, "geez that's interesting." I wonder if I have a chance to go for that. So I applied for that position, and I have never looked back ever since. PRDnationwide: How has the PRDnationwide training events supported you and helped you achieve your goals? Rob:	So initially when I started, I was the new kid on the block picking up things and working out how the industry works. After a few months, there was a boot camp that was on, and I was sent down for that, and that was probably one of the best things. It helped me to understand how the industry works. It’s like when you are new in the trade you need to sort out the trademarks and work out how it all fits together. That boot camp helped me understand the structure and how to put it all back together, and it was like an incredible moment. Then it was clear - going back to do it, when I had to do it, and how I would do it. In my early days, as a starter in the industry, I did take a lot out of training. I would listen to every word and tried to take as much as I could. PRDnationwide: What exactly do you do to stand out from the crowd, and what makes you different? Rob:	When I started 17 years ago we were in a little town, and we still are in a little town, but simple things that were being done in the major capital cities that weren't being done here. So I suppose I was always trying to find what the next thing was, and I know this sounds crazy but I was the first to put a picture of a real estate agents face on a sign. I was the first to use professional photography in the town. First to use full professional photo signs. I did all those basic steps that they were doing in the cities. And I kept trying to reinvent every six months to keep ahead of the competition. Secondly, I was one of the first to put on a PA, and I put that on very early in my career because I could see where to put in the hard yards. I thought well everyone keeps talking about PA so I took the PA for half days work for a week and that escalated very quickly to full days and all of a sudden my business doubled overnight. So I think also having that penny drop moment where initially where I started I was just trying to get a sale, and you end up chasing buyers, and I realised very quickly, and it was probably only after only the first month we started that this doesn’t produce any income. It was then, I decided to "focus purely on the sellers, purely on the listing, purely on prospecting"- and that's been what I've done ever since. But it's all part of the process. So for me, it just kept on raising the bar, so you just keep active and do lots more of everything. Lots more of the basics. PRDnationwide:	If you can recall, what was it like when you handed over the first set of keys to the client? Rob: Well that was a long time ago, seventeen years. So, I feel like everything was obviously pretty exciting. The funny thing is, it’s no different now. Now I've sold anything from an eight million dollar house to a one hundred thousand dollar block of land. So it's not about the size of the sale that kicks you. It’s probably just that when you're dealing with a lovely seller, and you're dealing with a nice buyer, and you get them to connect, and it's a nice transaction that to me is still a bonus. So it's not the monetary value necessarily, its what you do to touch people in this business. It's quite cool to make that connection. I think it's interesting when a person goes to buy a fridge, it's a two thousand dollar item right, and they probably go to 4-5 stores to get the best bargain. They probably can and squabble over one hundred dollars. Same with the car, a buyer will look at a car, and they will test drive half a dozen cars, get in negotiations, and do all the research before buying. When it comes to buying a house - when people walk into a house, in less than a minute you know pretty well whether they will buy that property or not, and it's an emotional decision. So, it's amazing what property does to people. They may not look at that house again until another thirty days when it settles, but they've decided within the first thirty seconds. I think it is just fascinating. PRDnationwide:	What are your challenges in buying and selling property in a touristy place like Whitsunday? Rob:	Being a regional area you've got things the banks may or may not like in small regional areas because it’s a tourist town. So there can be some hurdles with banks. Obviously, we've got little things called cyclones as well. I think having a lot of owners that live outside the area and they might like a lot of properties. Your dialogue has to be very good and effective communication on the times you talk to these people because quite often your transaction might not be face to face. They're relying totally on what you are telling them. So I think communication is the key there. We are not a Sydney, or a Brisbane, or a Melbourne where you've got millions and millions of people. So we do feel little ripples in the economy possibly a bit more than what you do in major capital cities so that confidence can evaporate very quickly. PRDnationwide:	Okay, so what advice would you have for the buyers? Rob:	Well I think at the moment interest rates have fallen to a historic low that people don't have to cough up until it all goes crazy. It's as good as it gets I believe. I also think that in a world of instant gratification, everybody wants especially new buyers - they want the Taj Mahal for their first house, they want a new car, they want all the new bling furniture, and they want all the accessories. I think they need to take some of the advice from their parents. Years ago when it was all about, you make do with what you have, and you buy a property, and you pay down the debt. I think we are getting away from that, and I think that's scary what it's doing to the world. Good old fashioned values are good. PRDnationwide:	What advice do you have for aspiring real estate agents? Rob:	Without saying, you've got to have a positive attitude. You have to be a self-starter. This is a cutthroat game to a certain extent. If you can't just get on with it and make things happen, you will not survive. I think the problem is, too many agents take a short-term approach. You need to go two years - I have to train myself at this job one hundred percent, and I have to take all the knocks along the way, and if you can get through that, you can come out of it pretty good. If you're not competitive, there are so many other competitive people around you so if you're not ready to fight for the listing or do what you need to do then there are a few problems. I still reckon the top performers, obviously do it extremely well. But then after that, I do not think it is done effectively. To be the master of listing presentation, people do not spend enough time getting the listing presentation right. That's when you've got the chance to secure the listing. If you don't get past that, you've got nothing. I think for new players they need to spend time on getting listing presentations right. PRDnationwide: So tell us what is it like working with Christie Leet? Rob:	We've been working together for a long time, he's an amazing individual. His knowledge of the industry, projects is just phenomenal. I think he's a bit of a visionary on more fronts than just the real estate. Christie is very much about challenging individuals to be the best, and you'll either strive on that, and you strive to that, or you don't. Certainly, he strives to have people around him that try for that and strive for that. For me, I quite enjoy that because I love trying to up the ante all the time. The knowledge I have got from him certainly in the first half of my career was phenomenal. I couldn't thank him enough for the lot he shared with me, and the guidance that's for sure.